We don't see much of this anymore but back in the 60s, it was not unusual for record companies to put together instrumental groups to cover current hits in the hope of scoring a fluke hit single. And even if there was no hit single, these kind of bands were popular with older listeners. These albums were cost effective so they were profitable regardless. Liberty Records seemed to produce a lot of this kind of music. Trombones Unlimited is a mix of jazz musicians and Los Angeles studio musicians. I wouldn't call it jazz but trombone fans will probably enjoy it. 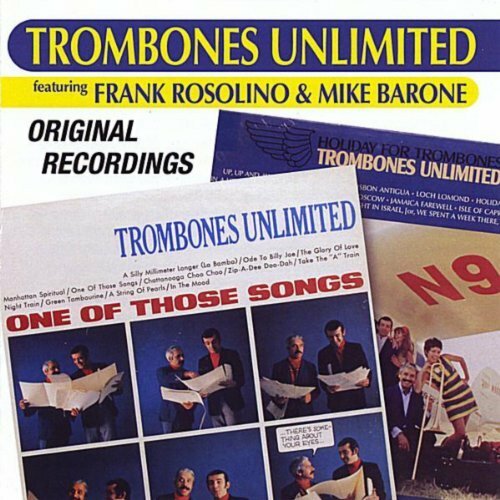 Trombones Unlimited was led by veteran jazz trombonists Frank Rosolino and Mike Barone. Rosolino recorded several albums as a leader in the 50s. But in the 60s he was a Los Angeles studio musician and he rarely recorded as a leader. Barone was much younger than Rosolino and he was in big bands led by Louis Bellson and Gerald Wilson. There was also bass trombonist Bobby Knight who was in Stan Kenton's band. The producer and main arranger was Tommy Oliver who was the musical director for the 50s game show Name That Tune. After he left the show, he settled into studio work. The other musicians were part of the Los Angeles studio collective The Wrecking Crew including Carol Kaye on bass, Nick Ceroli on drums, Jim Horn on flute, Dennis Budimir and Tommy Tedesco on guitar, Mike Melvoin on piano and Emil Richards on percussion. Be sure to check out the documentary The Wrecking Crew on Netflix and my review on the blog. They mostly recorded standards though Ode To Billy Joe was a big hit at the time and it was covered by other instrumental groups. Trombones Unlimited recorded five albums from 1966-68. Ode To Billy Joe is from the 1968 album One Of Those Things. Liberty released a few singles but there were no hits and the musicians returned to other things in 1968. I think jazz fans are aware that Frank Rosolino died in a 1978 murder suicide. 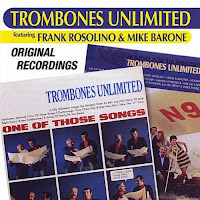 But Mike Barone is still around and he has released two CDs of Trombones Unlimited on his own label. Here's a video of Ode To Billy Joe followed by In The Mood by Trombones Unlimited. AccuRadio Song Of The Day-fun.